Even though this isn’t technically a blog, I have now decided to occasionally write and post book reviews here. 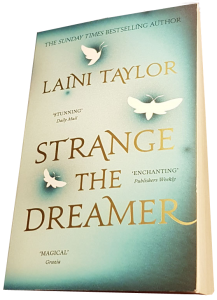 As it happens, I’m going to start not with one, but two books in a duology I absolutely love: Strange the Dreamer and Muse of Nightmares, by Laini Taylor. These books are the first I read from Taylor, and strangely enough (pun intended), they aren’t the books I meant to read. I was recommended Daughter of Smoke and Bone because of a character’s hair colour (I colour my hair blue). 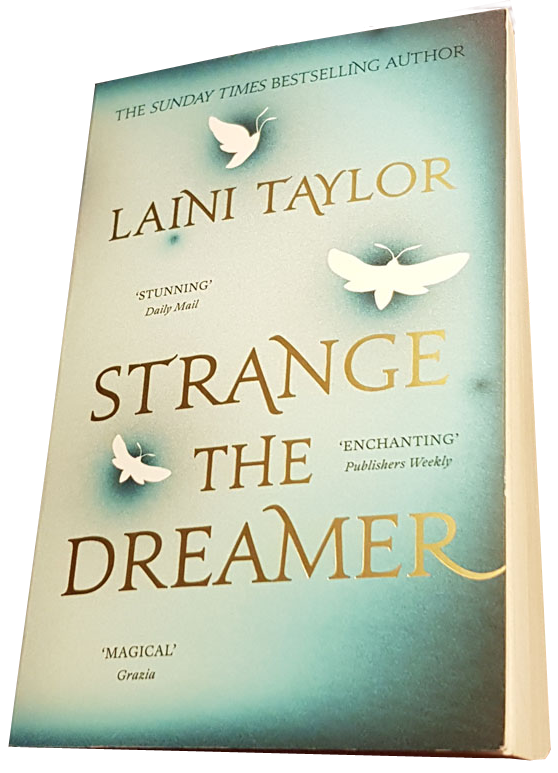 But I didn’t get around to ordering them and then, one day, in a book shop, with a gift card in my wallet, I found a different book by Laini Taylor, namely Strange the Dreamer. The cover was absolutely lovely: light blue with little winged insects in white, title in gold, tasteful and stylish. So I bought it. And without reading the back blurb, as is my habit when it comes to books or authors I’ve been recommended. When I read a series, the individual books often melt into one long tale in my mind, so that’s why I won’t review the books separately. In Strange the Dreamer, we start off with a prologue of epic proportions, hook- and story-wise. It’s two pages long but it caught my interest like no first pages ever have. I spent the rest of the book trying to figure out what the prologue meant. Next we get to meet Lazlo Strange, a dreamer boy, an orphan. Lazlo is who Kvothe might have been, had he been humble. Lazlo gets to go on an adventure, where he encounters age-old secrets, mysteries, tragedies — and Sarai, a blue-skinned girl who can shape dreams. The book is written from omniscient point of view, but because of the physical distance between the characters, we switch back and forth between Lazlo’s group of friends and Sarai’s. There’s some head-hopping occasionally, but then again, to me, most stories written in omniscient POV feel like that. I absolutely loved both the main characters. Perhaps Lazlo is ‘unmanly’ from some men’s perspective. Perhaps women write men softer and more emotional than they are. But I still love him as a character — perhaps because I am a woman. Sarai, however, I know is well-written. Women know how to write women. Or, at least, Taylor does. The other female characters, too, are complex and three-dimensional, even though we only occasionally get to glimpse the inside of their heads. 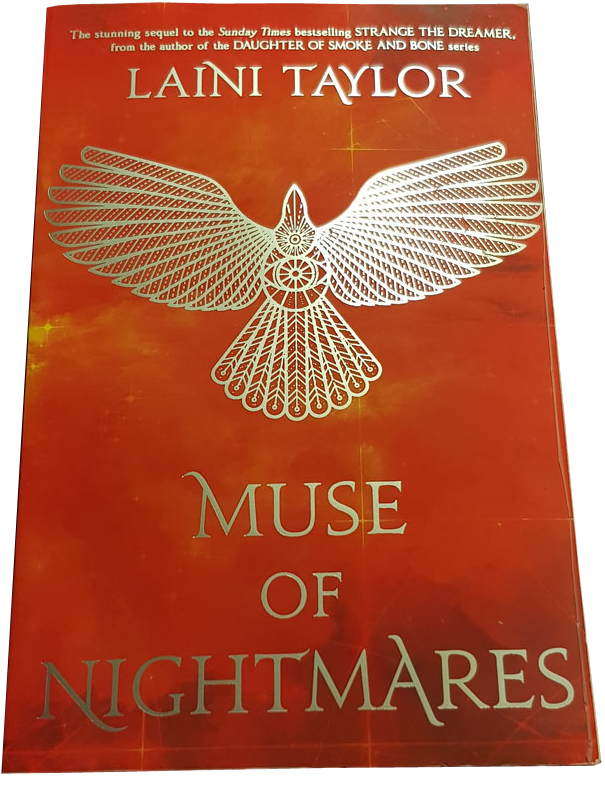 In Muse of Nightmares, the tale continues with the same secret/tragedy/mystery to be solved, but we also get to meet Kora and Nova, two girls in a fishing village where ice and limb-claiming cold form their daily lives. Their story gets interwoven with Sarai’s and Lazlo’s lives in a way they — and I — had not foreseen. The second book starts off slower than the first, with almost half consisting of little more than dialogue, but when it gets going, it sure gets going! The only thing I could wish had been done differently would be for the Kora-Nova storyline to be wrapped up better. As it is, it feels rushed, like Taylor was afraid to give the characters more time to speak. I had not expected two young-adult novels to rise to the starry sky of My Most Beloved Books, but they did. 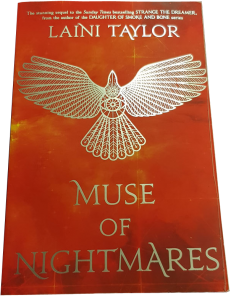 And unless the Daughter of Smoke and Bone greatly disappoints me, Laini Taylor will rise to my list of Most Beloved Authors. I salute you, pink-haired sister. Sexual violence. And a book I don’t like.